Julee Landau and Linda Wiener scored 2.95 masterpoints with a IMP game at Bridge On Shea. See full results of this game. 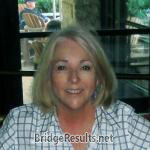 Julee Landau and Linda Wiener scored 1.75 masterpoints with a IMP game at Bridge On Shea. See full results of this game. Fred Klein and Dennis Mitchell scored 4.96 masterpoints with a ★61.11%★ game at In Tempo Bridge Club. See full results of this game.